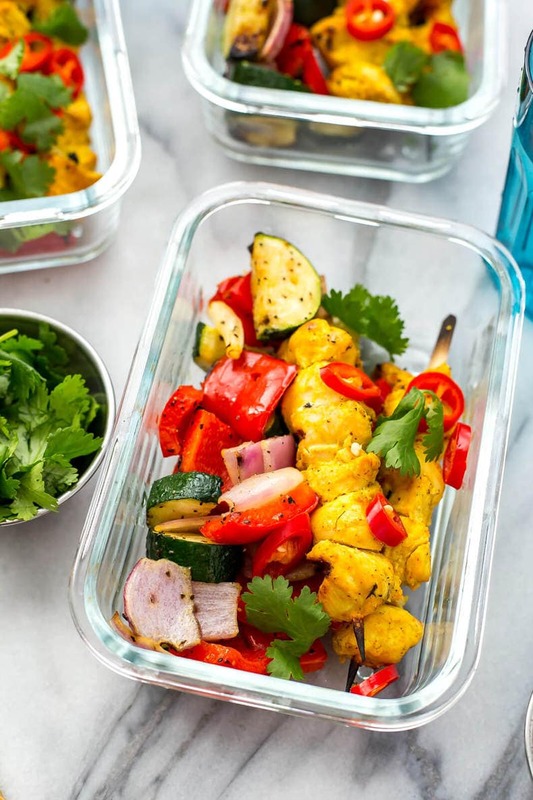 These Grilled Chicken Satay Meal Prep Bowls are a delicious way to enjoy BBQ season – just 10 minutes on the grill and the chicken and vegetable skewers are done and you've got lunches prepped for the week! 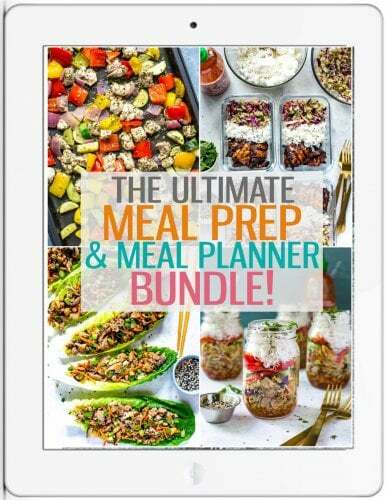 Say hello to meal prep made easy on your BBQ. And when I say easy, I mean everything getting cooked in just 10 MINUTES. Yes, I know, that's unheard of. But not when you're BBQing! 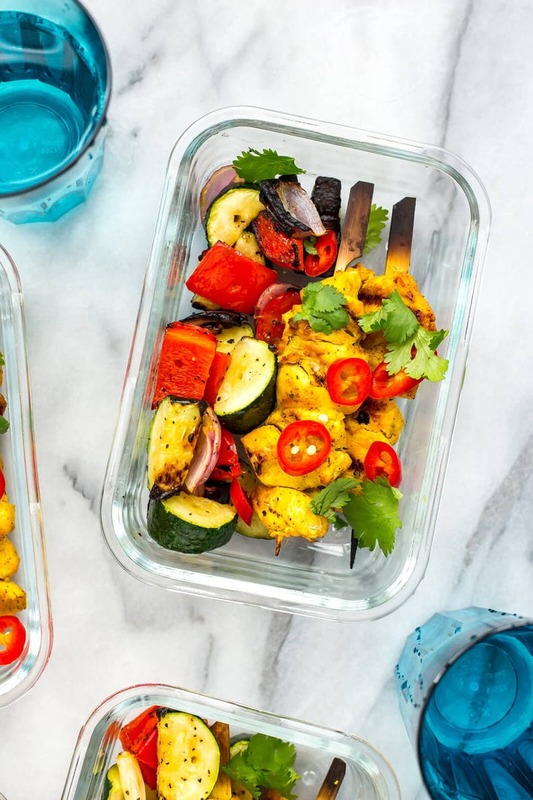 These Grilled Chicken Satay Meal Prep Bowls are made up of delicious veggie and chicken skewers, and let's just say it's the marinade that makes these bowls so special. I think I could eat chicken satay, like, every day of the week it's so good. The trick to getting these chicken satay skewers just right is by using high heat on the BBQ to get a nice char on the chicken, and of course the marinade! I've seen so many different variations on chicken satay and have even tried a version myself with these Chicken Satay Lettuce Wraps and it's pretty simple, but does require a little bit of planning ahead in terms of buying the ingredients. 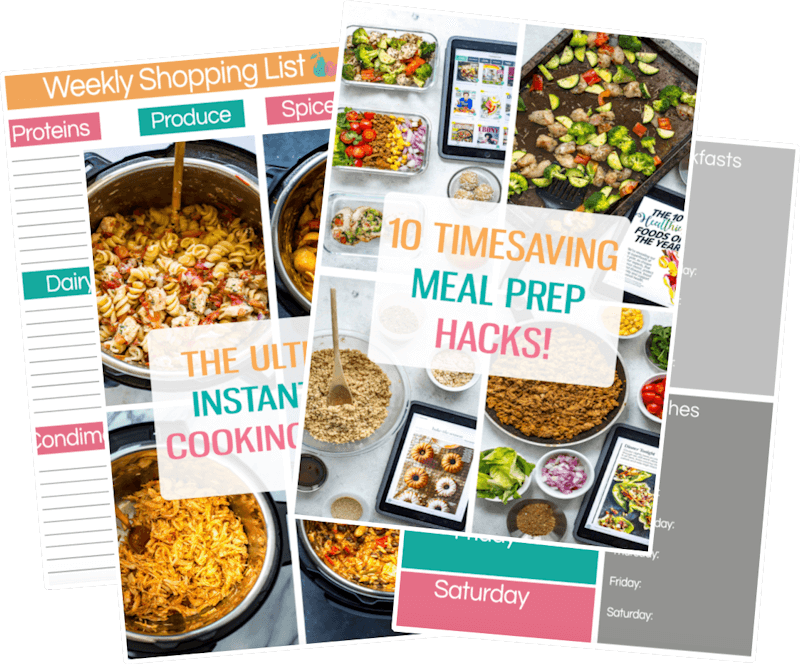 I'm actually pretty organized and well-stocked when it comes to my pantry so most of the ingredients in the marinade are what I would consider to be pantry staples, but you may need to run to the store for a couple things, like the coconut milk in particular, or maybe some ginger. I actually have found that most satay recipes don't call for coconut milk in the actual marinade itself but instead in a light peanut sauce, but since the flavours are so well developed in these bowls between the chicken and the veggies I skipped the sauce. Check out the lettuce wraps linked above if you'd like to add some though! I swear, each summer I forget about the magic that is the BBQ. It just makes everything taste so much better, especially veggies. In keeping with the way I usually cook veggies on the grill, I just tossed them with some olive oil, salt and pepper. If you want them to have a bit of a kick, you could add some paprika, garlic powder or chili powder but it's up to you! I find with the BBQ, simple is best! 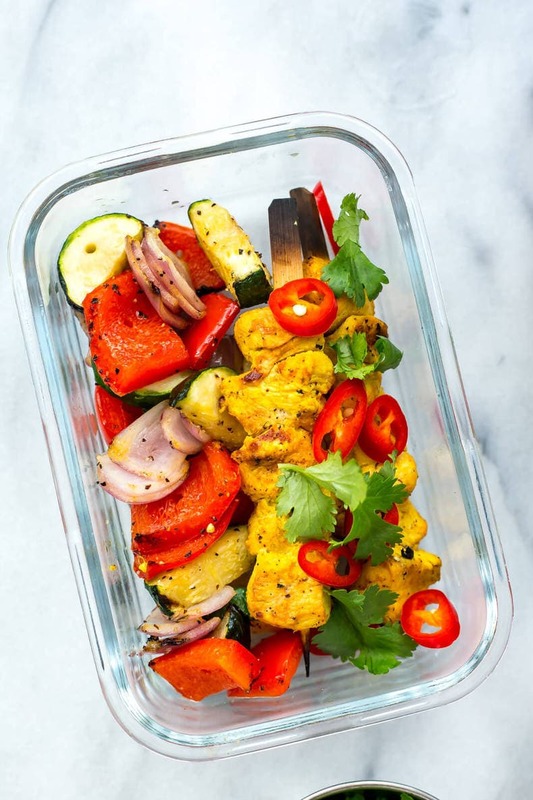 All the flavour is going to be in the marinade of these Grilled Chicken Satay Meal Prep Bowls after all! 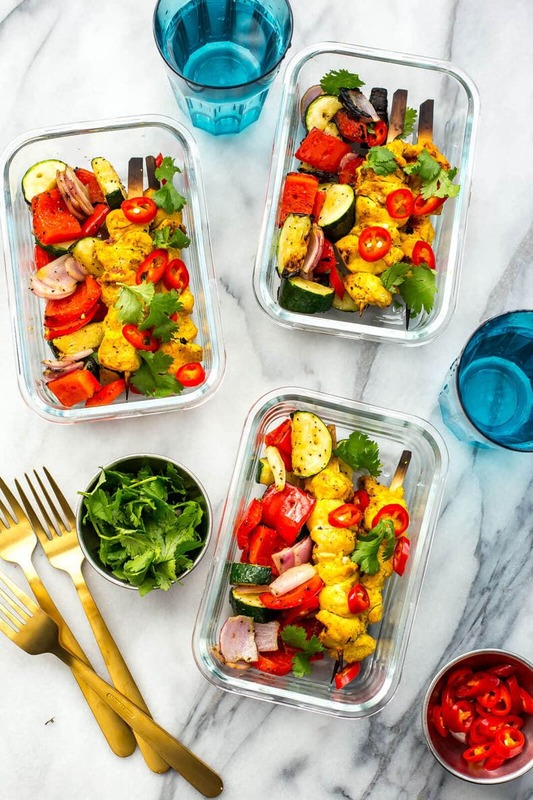 The chicken and veggies in these Grilled Chicken Satay Meal Prep Bowls actually require the exact same amount of cooking time so you can plan ahead and prep these to get them ready to cook together on the grill. I'll usually marinate the chicken first (you can marinate it up to 24 hours in the fridge) and then I add the chicken to mini skewers and the veggies to longer skewers. If you don't want to go out and buy two separate kinds of skewers, you could just use the long ones and string everything off and into the meal prep bowls once everything's cool enough to handle, but I like the look of the mini skewers for the chicken and it more closely resembles chicken satay that way. In terms of veggies, like pretty much ALL of my other recipes the ones you use in these Grilled Chicken Satay Meal Prep Bowls is entirely up to you! I almost always have bell peppers and red onion on hand and in need of using up, and I just love the taste of grilled zucchini so that's one of my go-tos. You could also do mushrooms, broccoli, sweet potato, asparagus and more so don't be afraid to switch and it and make this recipe your own! If you're not looking to make a low carb bowl like this too you could also have some rice cooking in the rice cooker or plan ahead to throw some baby potatoes on the grill. 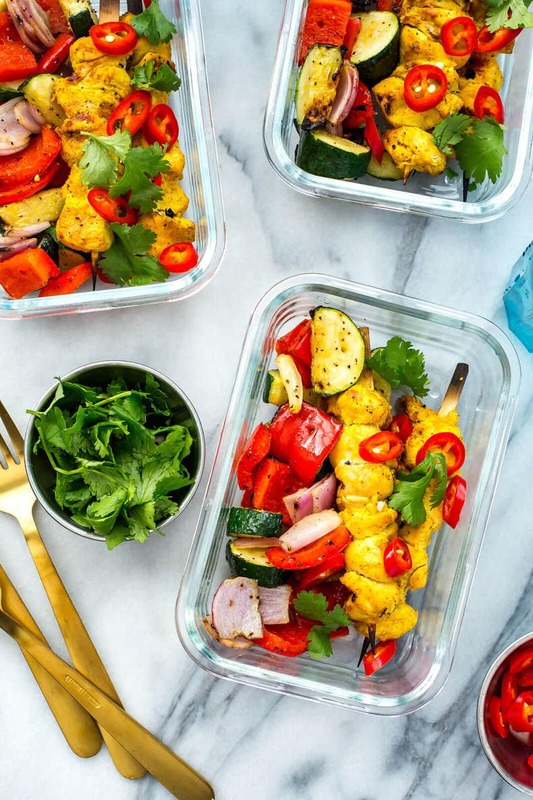 You can usually find a pre-packaged container that's ready to throw on the grill with the seasonings already included so it's easy to get some starch in there. I'm always down for potatoes, mmmm. 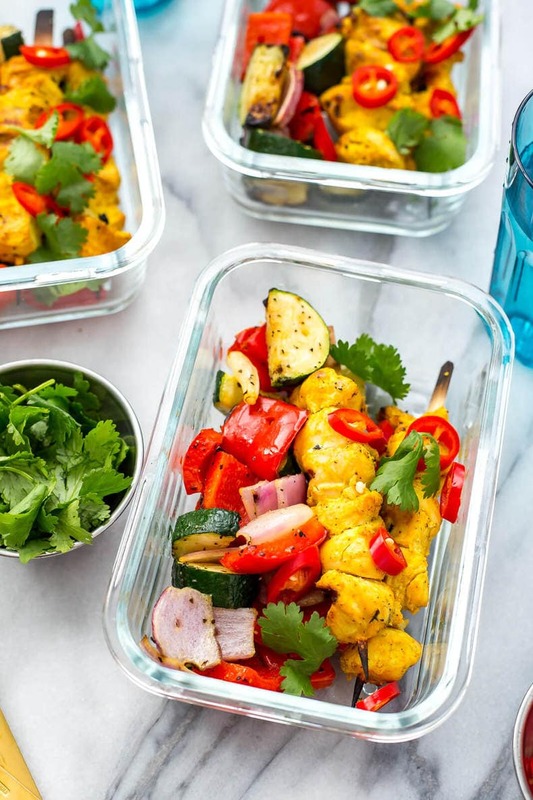 From there, it's just a matter of adding a little finishing touches to these Grilled Chicken Satay Meal Prep Bowls, like some fresh chopped cilantro and some sliced red chili peppers. If you don't like spicy, be sure to slice the pepper in half lengthwise and cut out the seeds so that you just get the flavours of the peppers and not any overwhelming heat. 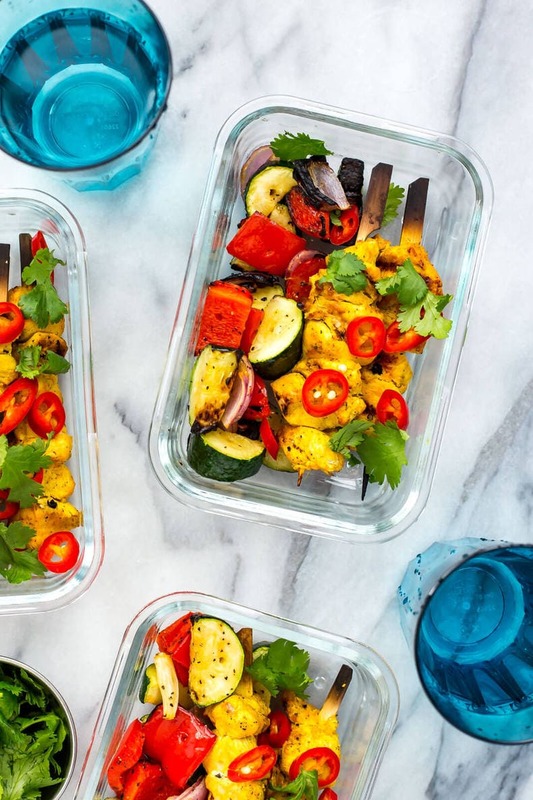 Will you be making these Grilled Chicken Satay Meal Prep Bowls? I really don't think meal prep gets much easier than this. 10 minutes on the grill and you're on your way to delicious lunches all week! 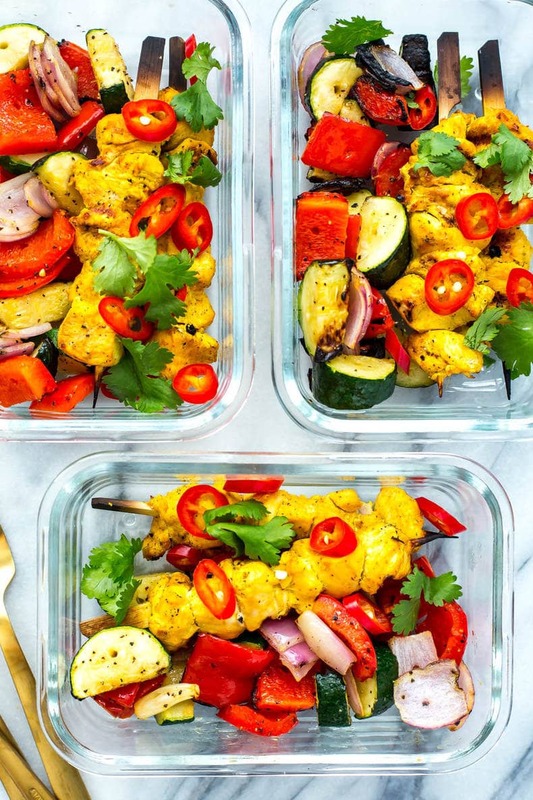 These Grilled Chicken Satay Meal Prep Bowls are are a delicious way to enjoy BBQ season - just 10 minutes on the grill and the chicken and vegetable skewers are done and you've got lunches prepped for the week! Preheat BBQ to high heat (mine usually heats to 500 F). Mix together ingredients for chicken satay and let chicken marinate for 30 minutes or so. 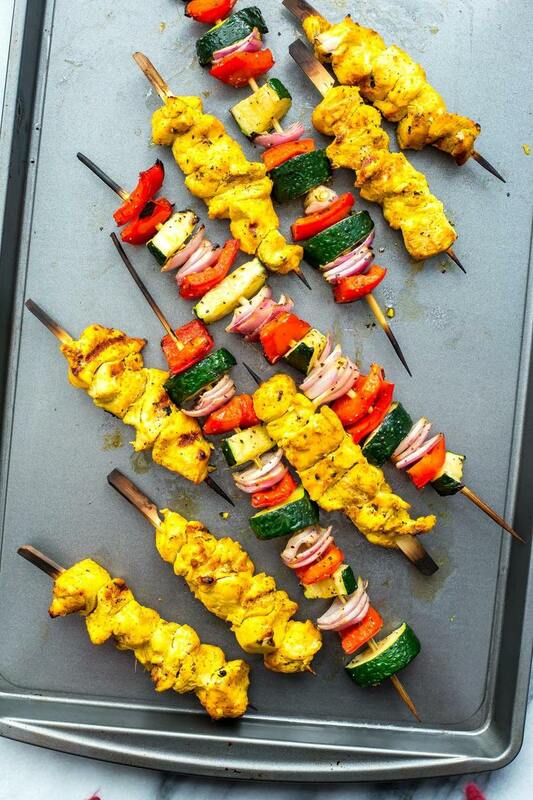 Meanwhile, toss veggies with olive oil and salt/pepper in a large bowl, then add to long skewers. Add chicken to smaller skewers (use large if you don't have any). Grill chicken and veggies together for 10 minutes, flipping once halfway through. Remove from grill, add to meal prep bowls and top with red chilies and cilantro. Serve along with rice or quinoa if desired. Leftovers will last in fridge up to 5 days.